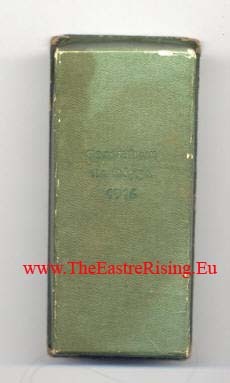 1916 & 1966 Easter Rising Active Service Medal, Armband & box details. 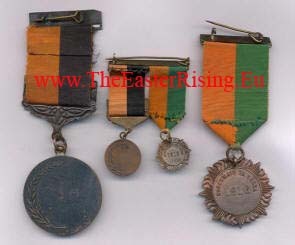 In order to mark in an appropriate manner the 25th anniversary of the 1916 Rising, the Government decided (1) to hold a special commemoration parade, and (2) to have struck two medals, one for those who took part in the Rising, and the other for those who had service subsequently in the War of Independence. The parade was held on Easter Sunday, 1941, and consisted of units of the Army, Old I.R.A. units, surviving fit members of those who took part in the actual Rising, and units of the various emergency defence forces. 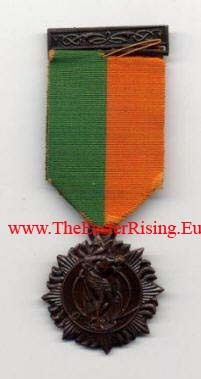 The 1916 Medal, mounted on a green and orange poplin ribbon, depicts Cuchualain in a dying attitude, and the design is the work of a corporal serving in the Army Corps of Engineers. 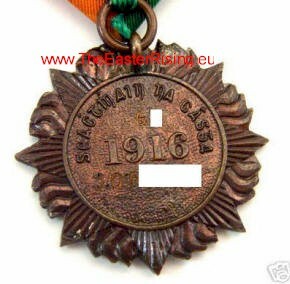 This medal is awarded: (1) to persons in possession of military service certificates for service rendered during Easter Week, 1916; (2) to persons who did not apply for such certificates, but who can produce evidence to show that if they did they would have been entitled to a certificate; (3) to the next-of-kin of those persons who have since died and who had such certificates, or would have had them if they had applied for them. 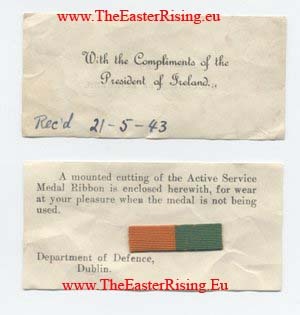 Included in the box would be a paper slip reading " With the Compliments of the President of Ireland" on one side and "le Deig-méinn Uactaráim na hÉireann" on the other. A small cutting of the ribbon was also included for wearing without the full medal. 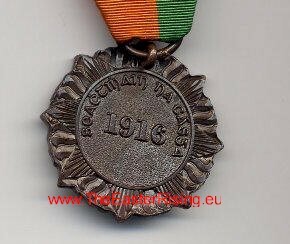 The 1916 Medal was manufactured by P. Quinn Limited .and The Jewelry and Metal Manufacturing Co. There are slight variations between the different batches. The ribbon on the left hand medal is neatly folder and sewn while the medal on the right hand side is only folded. 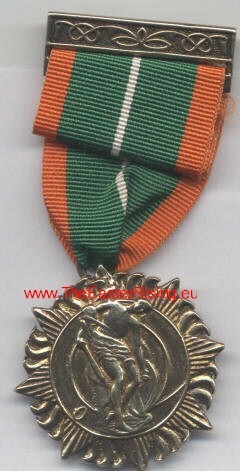 The right hand medal was a replacement issued in the late nineteen eighties. The top bar comes in two different sizes, the smaller left hand side example being the older. 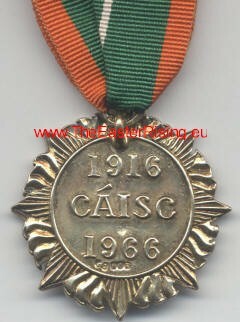 The 1916 medal was issued un-named , however it was named and numbered when issued in 1941 to the families of those participants who had died before 1941. 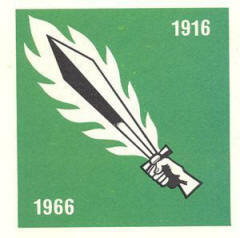 This included the approximately 84 - 86 killed in action during Easter Week. 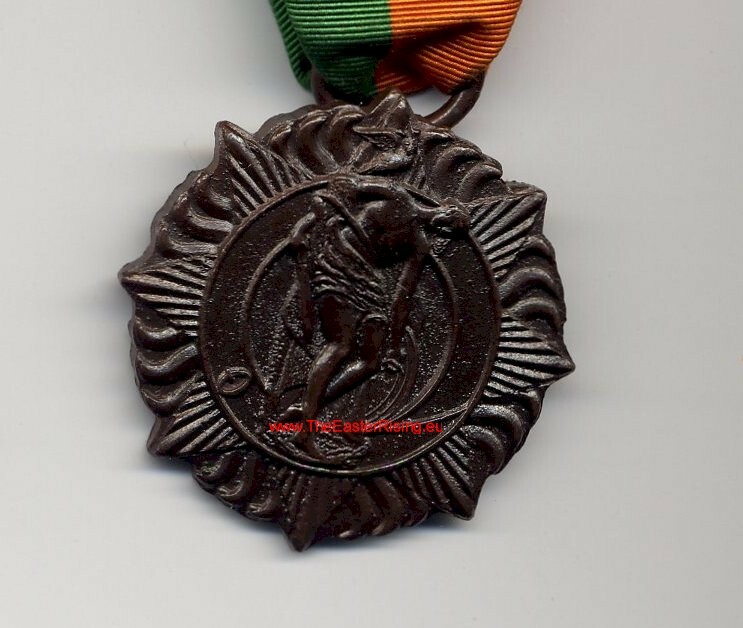 Paul Murphy of the medal Society of Ireland compared the alphabetically listed names of 84 participants and found that they order almost matched the issue number on the medals. 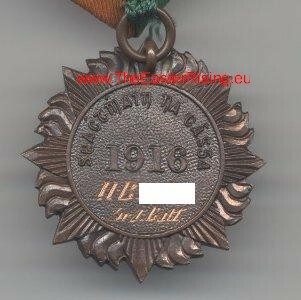 Other Medal Society research indicates that their were a total of 1,080 posthumously issued Comrac medals and 1360 posthumously issued non combatant 1917-1921 service medals in total. It is difficult to see and I have deleted some of this information for the security of the eBay medal purchaser. This example was privately named and includes details of his battalion. 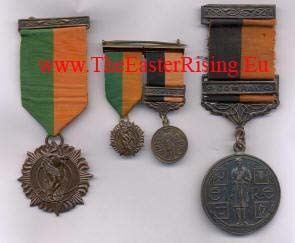 Shown below is a miniature 1916 (and 1917-1921) medal worn instead of the larger medal on possibly less formal occasions. These miniatures were only obtained by purchasing them and thus there are very few in existence as the average 1916 combatant would not have been able to afford one. 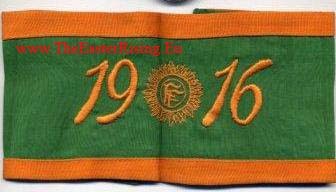 The 1916 armband was the first decoration given to veterans of the 1916 Rebellion. 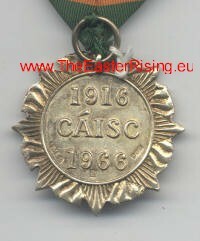 It was awarded at a ceremony held at the Rotunda Rink, Dublin, on Sunday 21 April 1935 to mark the 19th Anniversary of the Rebellion. This armband was worn by Volunteer veterans with civilian attire on ceremonial occasions, prior to the introduction of the 1916 medal. 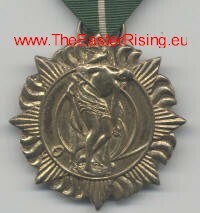 This silver medal was marked with a special silver hallmark "the sword of light" for the year 1966. Also shown below is "J. M. Co." for the manufacturer "The Jewelry and Metal Manufacturing Co"
This example , issued as a replacement in the late 1980's, is similar to the active service medal replacement with its ribbon not folded or sown. The silver hallmarks also differs.